You know that saying, if you can’t take the heat get out of the kitchen? Well, the same thing applies to the backyard at our flip. 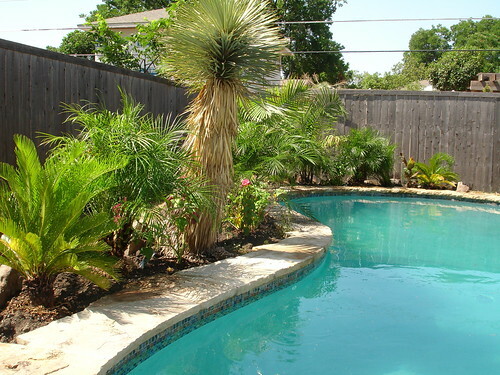 That puppy gets H-O-T in the Texas heat, so heat and sun-tolerant plants were a must when we were thinking about landscaping around the pool. With our requirements for hot ‘n hardy plants that fit in with our funky palm tree, coming up with a tropical, oasis-like landscaping scheme was a no-brainer. Now that you’ve heard all about how we transformed the backyard, I thought I’d give you the scoop on which plants we picked, and why. Here we go!! 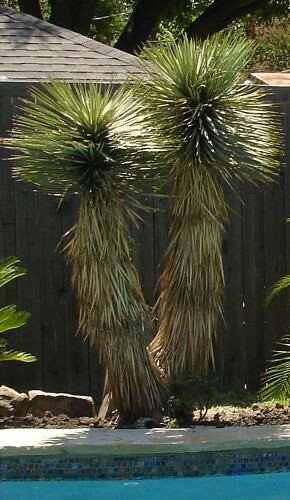 These plants below form the main focal point of the backyard. By choosing plants of varying heights, we were able to break up the large expanse of fence behind the pool, and add some texture and visual interest to keep your eye moving from plant to plant so that you don’t miss a single one of those beauties. While we wanted the majority of the plants to be green to form kind of a backdrop for the gorgeous pool, I couldn’t resist a few fun pops of color with those giant hibiscus – they had me from hello! 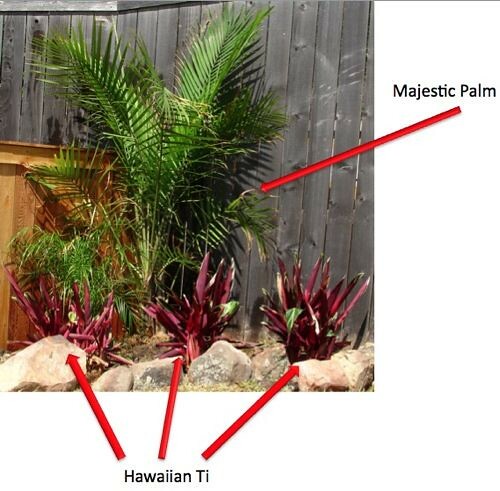 Each one of these tropical plants is tolerant of full-sun (a necessity in this backyard) and lots of heat. The few days a year that Dallas gets below freezing, all the new owner will need to do to keep these plants happy is cover them with a sheet – easy! We also added a little planting vignette over by the new fence that was constructed to hide the pool equipment from view. Our goal was simply to break up the fence a little bit (a common theme, it seems) and add a little pop of color in another corner of the yard. So now you know all the nitty gritty about those fun tropical plants hanging out by the pool! The word on the street is that the pool will be ready to swim in this weekend – yippee!! 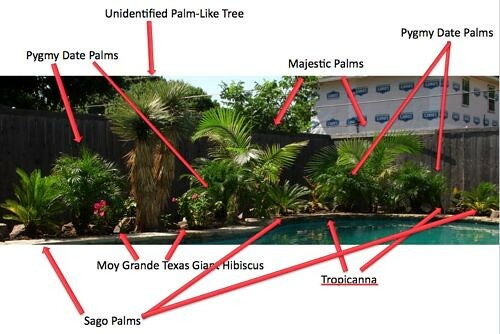 Now, here’s my big question to you guys – does anybody know what the heck that unidentified palm-like tree is over by the pool? I wanna know!! 2) The inclusion of your renovation on Lindsay’s site was fabulous, and a terrific perspective. 3) Will you be serving margaritas at your pool party on Saturday? What is the EXACT address again???? What a backyard oasis! The palms everywhere look great. The buyer will be lucky to have such a beautiful, relaxing back yard! Great plant selections — I love hibiscus! Oh thanks for sharing these sun loving plants. I’m always looking for something that can tolerate the sun and heat! You are going swimming in it this weekend, right?! Ha, you’re so funny!! Wouldn’t margaritas be fab?? Wow, it would be so fun to be featured on your blog! I’m so excited (and doing the happy dance!). 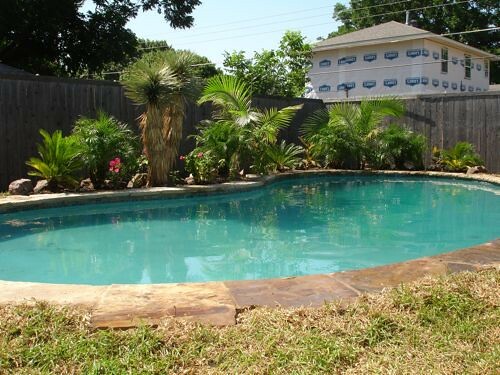 We are DEFINITELY going swimming this weekend – I hear the pool calling to me right now! Joan is a RIOT!!! Where can we find Joan’s blog?!?! Are you out there Joan?! However,I love being inspired by Liz’s site, and the creative, fun things you guys are doing also. I enjoyed particularly the terrific look of your blog, and will definitely come visiting again. I hate to be dorky, but does ANYONE out there stencil (not happy ducks)? I have a room with no molding and maybe stenciling would lend it some definition. Now that is a awesome backyard! I was sent over by Lindsay and I must admit, I’m super impressed. You guys are doing a great job.